When Princess Snow White is forced from her own kingdom by a jealous Evil Queen, she finds herself lost, confused, and surrounded by a small band of odd, though well-meaning, forest-dwelling dwarfs. 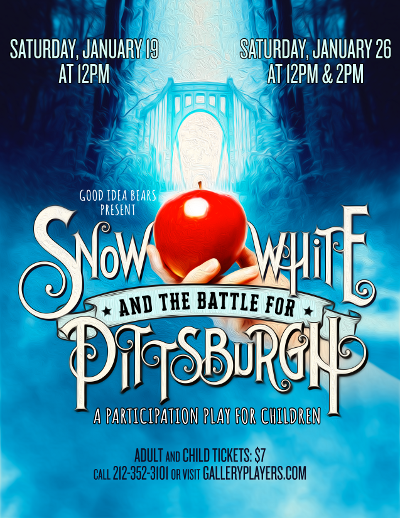 Cut-off from the humdrum of royalty, Snow White must decide where she fits in and who she wants to be. But all the while, the Evil Queen grows more powerful and well…evil, until it becomes clear that no one is safe from her malevolent reign! Can Snow White and her new friends stop the Evil Queen and her Magic Mirror once and for all? Will this wide-eyed princess become the hero her kingdom needs? Join us on this interactive musical journey of friendship, bravery, and self-discovery to find out!